Earthmine, a geo-mapping company have created a 3d map of San Francisco that anyone can jump into and graffiti on through an application. 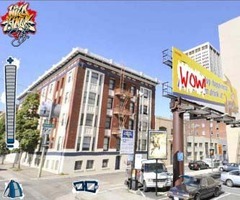 The app is called Wild Style City and is a good example of augmented reality working its way into app stores. It’s like a 3D google streetview that you can interact with, by leaving tags, marks and little doodles over the buildings, roads and pavements. The best graffiti tags get marked up and voted for. Earthmine gets the data for its maps in the same way as Google – by sending camera covered cars down real streets, but its high-res cameras take in more information than Google allowing Earthmine to create a more detailed, more 3D map. The extra detail means that it’s more than just a better version of Streetview, it’s also useful to architects or anyone who needs exact spatial measurements. Earthmine are opening up their maps to developers hoping to attract applications that make use of the detail their maps offer. It’s all riding on the surge of interest in Augmented Reality or AR – where computer-added information enhances the real world: reviews tagged onto restaurants for example or directions overlaid on streets.